Paris is seriously one of the most beautiful cities in the world and I can prove it. While for some the city can be either a hit or miss based on their experience there, in all my many journeys there, I always find it charming and oh so gorgeous to explore. I can always find enticing places to shoot and add to my Instagram feed and I want to help all who visit have the same experience. If you're looking for some unique spots to photograph while you're in the city of light, then check out my recommendations. Who said basketball courts have to be boring? 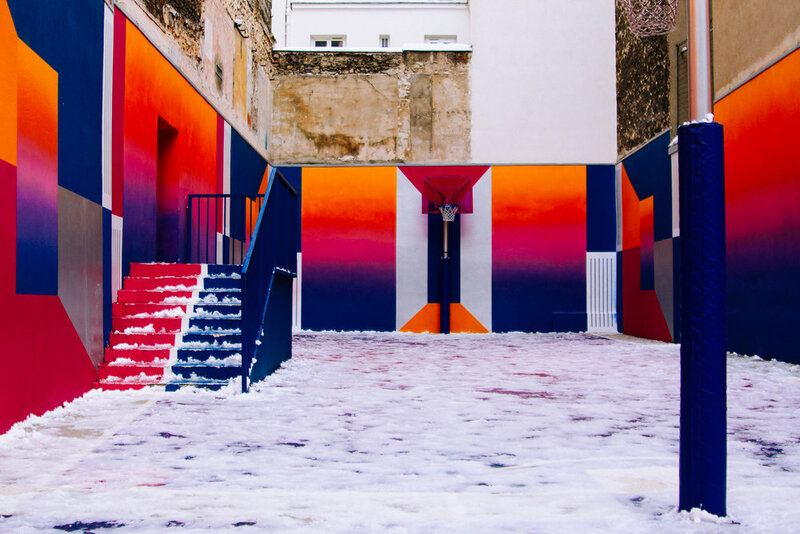 This unique b-ball spot is perfect for a photoshoot or just to play a quick pick-up game. Notting Hill isn't the only neighborhood with colorful houses. This quaint little street in Paris is rainbow realness. You can find many an influencer taking fashion photos here. If you don't have time to go all the way out to Versaille, you can get a taste of golden hallways right in the city. The opera house in Paris is absolutely gorgeous and the inspiration for the Phantom of the Opera. If you want to visit the world's prettiest shopping mall, pop in here and be amazed. It feels so luxurious and way too fancy for anyone by royalty to enter, but it's open to all. One of the best views of Paris is right near Sacré-Cœur. If you walk down and to the right of the church, you can find a fence that has a straight shot view of the Eiffel Tower. During sunset, the orange sky is like nowhere else. Some places deserve a look up to the sky. This small square perfectly frames the blue sky and is one of the few courtyards in Paris where you can attain this unique look. For a silhouette of the Montmartre skyline, head to the Musée d'Orsay and find the giant clock on the fifth floor. The museum is also a great place to check out art, but the clock is the best part. This metro station is an iconic spot for its view down the stairs and traditional Parisian cafe at the bottom. During golden hour it's particulary lovely. Have you ever seen that Edward Hopper painting of a New York City diner late at night? Well, this cafe in Montmartre has a similar feel to it and makes for an interesting shot in the evening. In French, "pain" means bread, so don't assume this is a torture chamber. This cute bakery and cafe in Montmartre is adorable, has great treats and Instagrammable coffee cups. 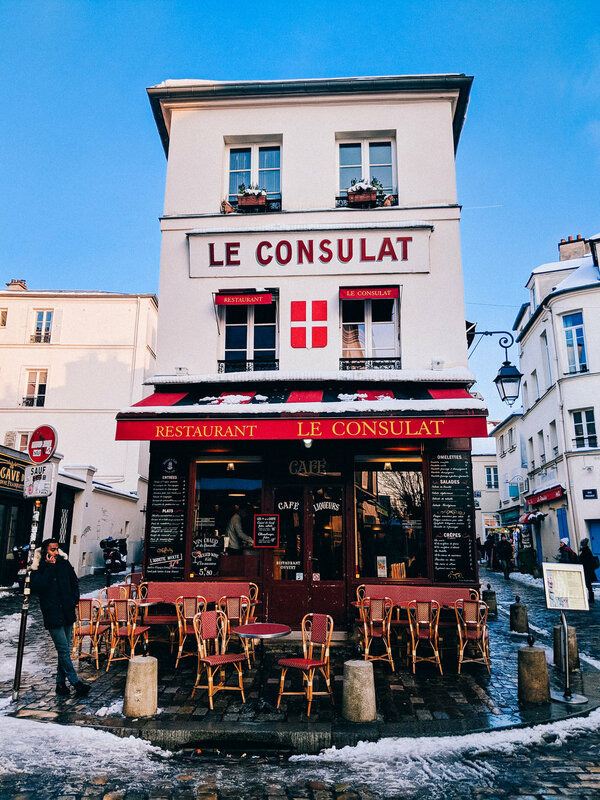 This iconic cafe in Montmartre is a must for anyone who wants their Instagram to scream Bohemian-chic. It's impossible to miss when walking around the neighborhood. For a courtyard with some unusual art mixed with historical architecture, find the Palais Royal near the Louvre. These stripped pillars are a great juxtaposition against their backdrop. Here's a map to make your life easier when you go finding these locations.